I have finally decided to change heat panel that i prepared earlier. Did some modifications and added more white LEDs. Mounted vectra b steering wheel coil, white LEDs in steering wheel wired remote and changed smd resistors with ones that pioneer units recognize. Got ugliest switch for hazard lights, just to cover the hole. Ima switch that ASAP. Soldering SMD resistors with appropriate values and modifying pcb. Reworking vectra b steering wheel coil harness with calibra connectors on the end. I was testing spare CarPC using HDMI on Pioneer AppRadio, turned out to be fully functional! I cant use touch input until i disassemble the pioneer unit, and try some stuff, so ive bought armrest to fit 3D SpaceNavigator with commands i programmed years ago. More armrest mods, it has 7USB ports for charging sharing ONLY 1A. Ive got some 12v 2x2.1A usb charger. Changed SpaceMouse holder angle and painted it black. Now we have armrest with 3 front USBs, 4back USBs sharing 2.1A. Other 2.1A port is located inside the armrest, and another USB connected to the PC. Final position of the armrest, its retractable so it has 2 levels of height. Ima swap these leds to white ones, one day . CarPC will be located in the trunk. Finally removed hood vynil. Got so many new and old scratches so i decided to fill em all . In the end 3 layers of black spray filler and soon ima wrap it in one shiny color, probably glossy black, simple and clean. Fits perfeclty, i plan on putting 63mm polished FMIC pipes in the future. Wrapping with cheapest black gloss wrap not so shiney but will do the job for short term use, better then my old damaged paintjob for sure. Few gargy approved 300rsd 'n' less certified program modifications. Gearbox and handbrake cheap "leather"
Wrap made me nervous, not so glossy and visible scratches all around. An awesome job! Great car in every aspect! It was great pleasure to see her in new outfit, also driving together a few kilometers on highway two weeks ago. Had some troubles with radiator hose, it was my mistake because i had to cut it and then it was wide to fit on radiator, put narrower one first, it held for about 500km, then i oredered new one. 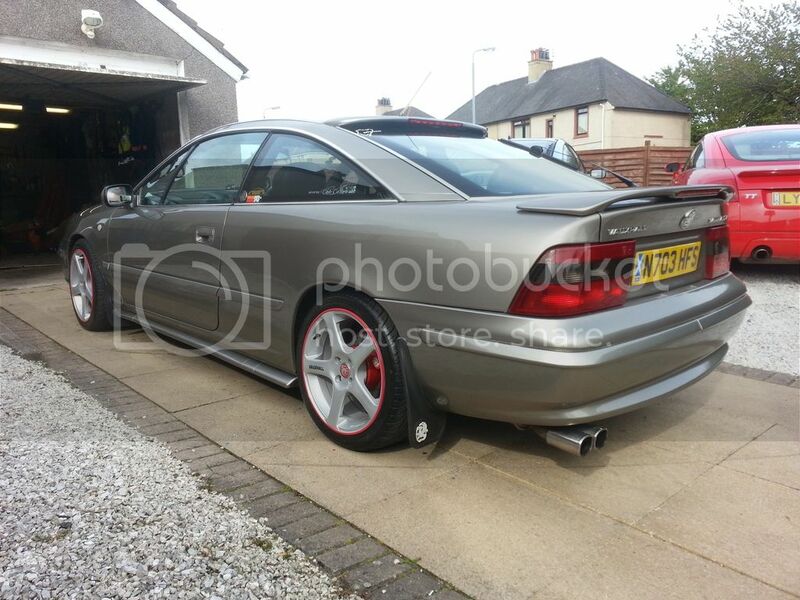 Awesome Calibra, how they should be done. Shout out from Slovenia to Serbia! Finaly got 55mm rubber hose to remove those narrowings ive had to the tophat. Temperature is fine now but didnt have rough contitions, driving up the mountain with 4 peaople in the car, with ac on summer 40degrees day . Also got new coolant bottle. One xenon bulb went out so ive bought 2 new, same as old ones 4300k. Changed headlight wiring, with relay holders, everything is soldered and insulated with heat shrink tubes, i was outta tape in the end, will sort wires soon but thats just the looks .